The Clivia plants are incredible this year. They sit right outside my studio window (we bring them in whenever the weather drops below 40 DegF), and bloom during February and March. We bought the one lone little cliva plant on our way back from vacation at a little plant shop in Marshall, TX. For the first two years, we struggled to keep that little plant alive ... too much sun, too much shade. Finally we moved to another house, where it was quite happy. Then, 8 years ago, we moved here, where it is obviously really happy as the one lone little plant has mulitiplied to about 12 plants in three different pots. 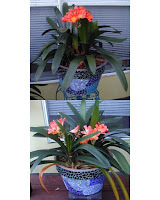 This year, for he first time, each plant within the pots are each producing a bloom. There' blooms now, plus more just forming, so this wonderful display should go on for at least another month. It's always a great surprise and pleasure when I open y studio blinds each morning .... flowers in the winter landscape.